This technique creates the warm, traditional look of fine furniture. Unfinished doors and drawer fronts are randomly distressed and then over-sanded. 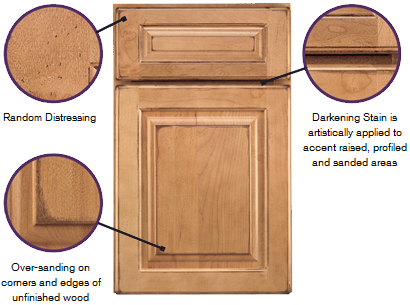 Next, a darkening stain is artistically applied to the corners and raised areas, creating a burnished effect. A base stain is then applied and carefully hand-wiped. Burnished finishes are created by a very complex process: random distressing, over-sanding and application of a burnishing stain. The random distressing and hand-applied techniques of burnishing produce one-of-a-kind results where no two doors are exactly alike. Burnished Ginger and Burnished Chocolate include flyspeck highlights. This technique involves a random spattering of a complementary finish color, which adds depth and dimension to the finish.